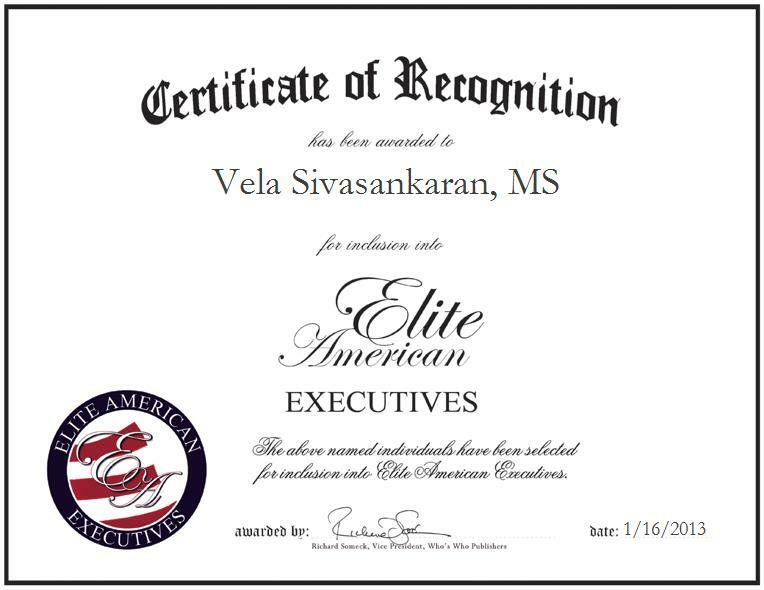 Vela Sivasankaran, MS is the Chief Software Architect for Aegilon, a leading software company offering software and computer services for health care information management and integration. With a pronounced background in telecommunications, healthcare, e-commerce, banking, software development and web design, Ms. Sivasankaran shines as a luminary in her field, skillfully and proficiently conducting research for the cultivation of cutting-edge technology for veterans in need of health care. An expert in software architecture, Ms. Sivasankaran has published research papers through the IEEE and participated in international conferences. She has a patent in the EU and a patent pending in the United States in advanced communications software. She would like to tell the younger generation to be open to learning about new technologies, utilize the opportunities they come across, and think outside of the box. Throughout her career, Ms. Sivasankaran has herself pioneered various technologies, including such voice-over- Internet protocols as Skype. She has worked with both Fortune 100 companies and successful startups. Her accomplishments include developing telecommunications systems for veterans so that they can have access to important information from their homes, eliminating their need for hospital visits unless necessary. Ms. Sivasankaran has garnered a reputation of distinction for her uncanny ability to explore new and innovative advancements made in technology, and for her creativity. She has always had a strong desire to benefit humanity, simply by making the most of the latest technology. Ms. Sivasankaran has always wanted to be a scientist—this was a position that she felt would enable her to delve into the depths of science and technology, and to serve as an agent of positive change, going beyond the call of duty in order to simplify the lives of others. She pursued a career in information technology because she wanted to follow her dreams of helping people while conducting technological research that would be conducive to society.